Twitter isn’t just a place to tell the world what you’re eating or to brag about how many followers you have. It can also provide you with money-making opportunities. We here at US-Ask Blog use Twitter every day (take a look at us here @fahimtm). 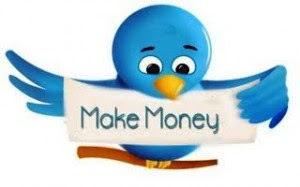 So read on to find how you can use Twitter to make money and market yourself and your business. Twitter is a social network that allows you to express your thoughts in no more than 140 characters. Since its launch in 2006, (when Jasmine joined it, by the way!) Twitter has gained more than 300 million users.Celebrities use Twitter to gain popularity, journalists use Twitter to break news stories and businesses use it to communicate with their customers. If you have interesting and useful things to say or a product that others should buy, you might just be able to use this social platform in order to make money. Take a look at our five ways below. Marketing yourself is the best way to sell your services. Are you a great web designer? Do you posses indispensable creative skills? Or are you simply trying to find a new job? Promoting your services on Twitter is a great, free way to find work, sell your skills and make money. Many professionals use Twitter as a way to stay in touch with other people in their industry. This kind of digital networking allows you to develop relationships, develop partnerships and sell yourself to do work. Also, tweeting about your latest services and current work can grab the attention from people all over the world. Twitter is a universal sales platform so in this case – the world really is your oyster. A little self promotion can quickly lead to a sale or even a job. However, don’t just use Twitter to push yourself or your services. Tweet useful stuff, fun stuff, questions, answers and even quizzes. No one wants to be bombarded with sales pitches all the time. Create real interest in real information and entertainment and people will be more likely to take a look at what you do for your ‘day job’! Many celebrities have embraced Twitter in order to make some extra money. The likes of Justin Bieber, Kim Kardashian and Beyonce who have millions of followers can make a bucket load of cash for just a single tweet. It’s highly unlikely that any ordinary person is going to be able to get tens of thousands, let alone millions of followers, but if you write a blog or website and have built up a good following there are opportunities where you can make money by getting sponsored to tweet. If a company feels their product will really appeal to your followers they might contact you in order for you to post a sponsored tweet. Usually, all this involves is posting a tweet every week or two mentioning another company or linking to their website or the service they’re offering. Companies may offer you a set sum of cash or in return promotion of your website on their social media platforms. Of course when tweeting sponsored tweets you must inform and show your followers that it’s sponsored otherwise they might think you are trying to trick them into buying a certain product or subscribing to a particular service. Tweeting your products is an essential way to advertise your products in the ecommerce world. Do you have an Etsy shop that sells handmade jewellery? Do you have a blog that you use to sell homemade cards? Or do you have an ebay shop waiting to get rid of all your Christmas presents? If so, tweeting links to your online shop is a vital way of attracting people to your shop and making money. Twitter can be a powerful platform for marketing your product. Research relevant hashtags for your industry, and include those in your automated Tweets to maximize their exposure. You can also promote your product by adding social share buttons on your product forms, which users can Tweet out from their personal accounts with links to your products. Don’t just tweet the links though. Tweet interesting stuff as well so that you start to gain a following. Certainly tweet discounts – ideally exclusive codes that people can use to get money off. 7. Produce your own Twitter-related service. Many people start a blog with one intention: making money. While this is not a good sole reason to start a blog, it is a nice added benefit that comes with building up your blog with quality content and maintaining a decent amount of blog traffic.